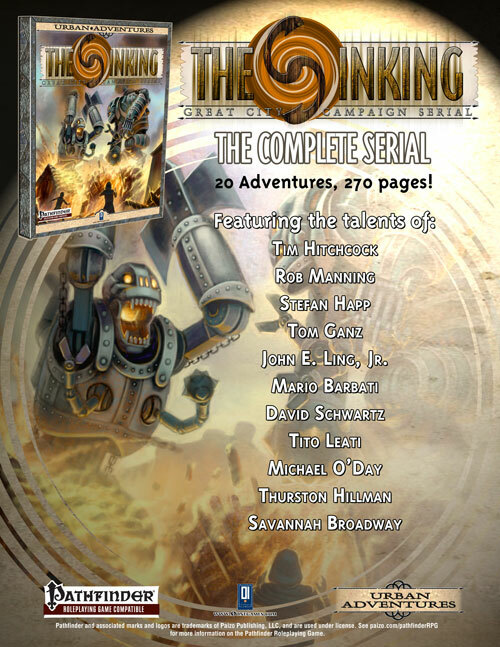 Welcome to the Sinking, a campaign serial designed for use with the Pathfinder Roleplaying Game. This book contains twenty adventures set in the Great City. 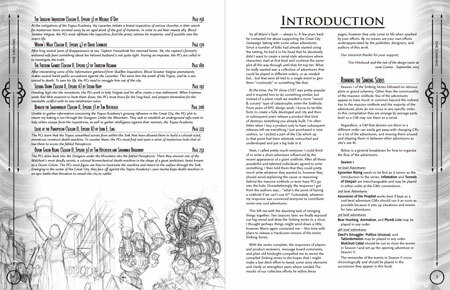 The adventures are tied to one single catastrophic event, a giant sinkhole opening in the very hearth of the Great City. While the first season adventures are loosely tied to the plot, the second season goes deeply into the mystery going straight toward the amazing finale! This is a campaign for a group of players starting at 1st level and going up to the 11th level. Did you buy all the single adventures before 2/17/2016? Then you can have this product for FREE! Just send the receipts of your purchases to sales [at] 0onegames [dot] com, you shall receive a free download.